Posh winger Jon Taylor will hope to continue his fine pre-season form at Barnet. Photo: Joe Dent/theposh.com. 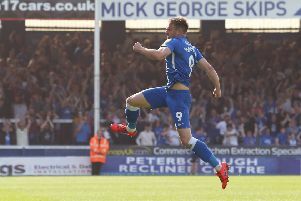 The battle for Peterborough United first-team places has really hotted up following the arrival of four new players yesterday (July 20). Newcomers Andrew Fox, Kieran Sadlier, Lee Angol and Souleymane Coulibaly are all expected to take part in tonight’s (July 21) friendly at League Two newcomers Barnett (7.45pm kick-off). All apart from Angol have been playing for Posh as trialists this summer anyway. “The whole squad is ticking along nicely though. We are fine tuning them now with the first competitive match in Rochdale in mind. The foundations are strong and we coming to peak fitness. It’s match sharpness that’s the priority now. Midfielder Jack Collison is not expected to take part tonight and nor is Harry Beautyman. Beautyman is still recovering from a thigh strain.